You can’t visit the Gatlinburg-Pigeon Forge area of Tennessee without attending at least one of their amazing dinner shows. We were given free admission to the Hatfield and McCoy Dinner Feud show but we had to pay for our meal, not a bad deal so we accepted 2 tickets to the 8pm show. 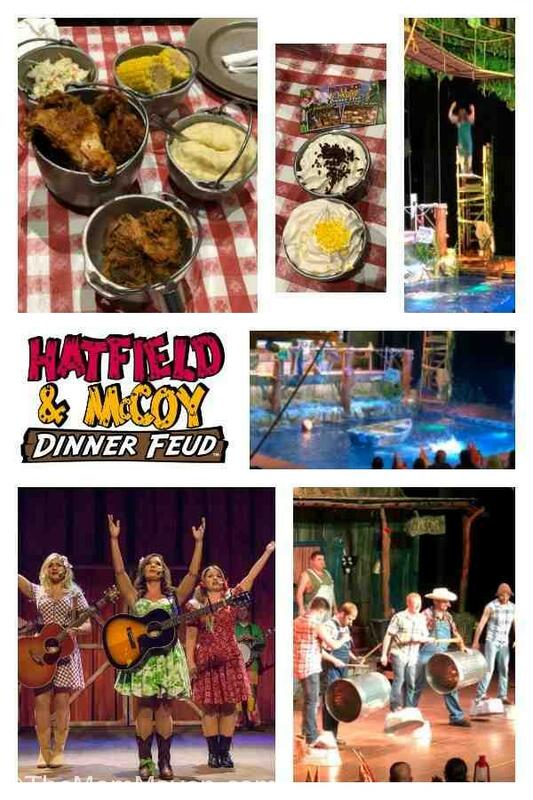 “The Hatfield & McCoy Dinner Feud™”, is loosely based on the historical feud of the same name. Instead of guns and knives these families “duke” it out by cloggin’, pickin’ and singin’ all while you and your family enjoy some of granny’s home style cookin’! The show offers guests extraordinary country, bluegrass, and gospel musical performances, award-winning hillbilly musicians, cloggers, diving hillbillies, long-jumping canines and a huge all-you-can-eat mountain feast. The feud is kicked off every day at 5 p.m. and 8 p.m. with occasional 2 p.m. matinees. Granny’s ‘all you can eat’ mountain feast includes; fried chicken, pork barbecue, creamy soup, mashed taters, corn on the cob, bread, coleslaw and dessert. Vegetarian, vegan, gluten free and dairy free meals are available upon request to your server. 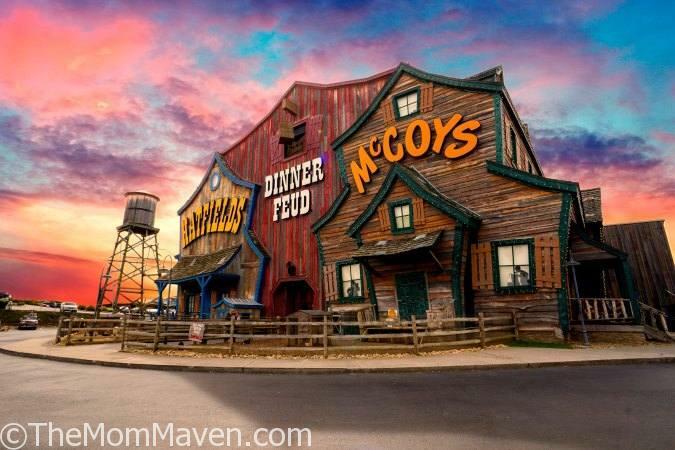 I highly suggest that you arrive at the Hatfield and McCoy Dinner Feud an hour before showtime, especially if you are picking up tickets at Will Call. The line for tickets was long and then after you get your tickets you join a much longer line that weaves through the store and ends up at the theater entrance where you will have your group picture taken before entering. When we arrived at our seats, far audience left, our server ran by saying she’d get to us as soon as she could but her “whole section sat down at the same time making things difficult”. Eventually she came back and took our drink orders and finally started bringing our food. The tables on the level below ours were placing their dessert orders before we got our fried chicken. The meal was good, nothing spectacular but not bad either. The creamy vegetable soup is so delicious they sell it on their website! For dessert you have a choice of chocolate pudding and banana pudding Ron got chocolate and I got banana, but I had a bite of his chocolate as well 😉 The banana was much better but they both tasted like they came out of a can not a kitchen. Once the show started we barely stopped laughing the entire time. The music was great, the story was hysterical and the stage was amazing. I’ve heard of stages that have water features but this one had an Olympic diving well that’s 24′ deep! It was a great show and we would go back again…after we check out all of the other great shows the Gatlinburg-Pigeon Forge area has to offer. If you are headed to Tennessee make sure you see the show! The show sure sounds great. Thanks for the ‘heads up’ about the lines. Do they have a handicap line or area?